There has been a bit of a theme running through the posts of late, albeit, unintentional, and this week is no exception. Firstly, couple of weeks ago, we had a surfeit of pears, so I made pear nectar. Next, it was peaches, so I made peach nectar and this week, it's Weissbier so we are making Beer Cocktails, as close to 'beer nectar' as you can get. All of the following cocktails are actually delicious and worth buying a bottle or two of fresh Weissbier to enjoy them at their best. When buying weissbier for this purpose, I recommend you buy a German brand such as Erdinger or Paulaner as oppose to a Belgian Witbier, which has very different tasting notes due to the tradition of brewing it with orange peel and coriander. I tried making Mr TG's beloved 'Flintoff' cocktail with a Belgian Witbier and the result was not up to par. No doubt there are some great cocktails to be made with it, but that's for another time. Today we are all about the Bavarian Weissbier which is generally cloudy, naturally sweet with an often, quite distinctive, banana note, not to mention, clove and vanilla - basically, very delicious. 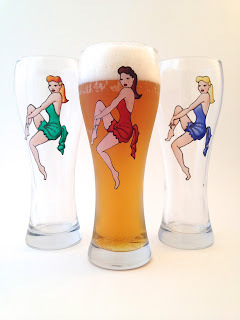 It is actually quite a highly carbonated beer, hence the big frothy head you associate with German beers, which helps counterbalance the malty sweetness of it. However, for the purpose of making cocktails, it is best to pour out what you need and allow it to settle, before adding it to the mix. Otherwise, you may have a few frothy overspills to clear up. Of course, there were no such worries for Mr TG and I, given that the fizz had long since departed from our brew, but even so, the use of a shaker is not recommended, except as static, mixing receptacle. The first cocktail is not one I can claim to have invented and there are many variations on the theme. Basically, it's a Mojito, but instead of topping up with sparkling water, you are using beer. If you are using a Rhum Agricole like Clements, which is a very young, white rum, with almost citrus notes to it, I recommend a less hoppy, lighter, more citrus tasting beer, like Corona, but with the Weissbier, I found a mix of white rum and dark rum worked better. Muddle (squish) the mint in the bottom of a cocktail shaker or large glass with the lime juice. Add the rest of the ingredients, plus a handful of ice and stir with a bar spoon (long handled like a sundae spoon) for about 20 secs. 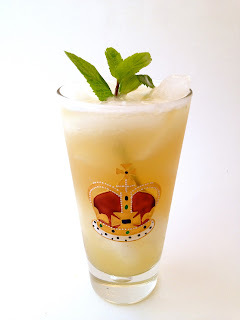 Strain into an ice filled tumbler or hi ball glass and garnish with the sprig of mint. Tip - if you slap the mint very gently between your palms, it will release the essential oils and enhance the minty aroma of your creation. I'm not sure what exactly inspired me to make this next drink, but I think it will be a moment of inspiration, I'll be eternally grateful for. It's very simple to make and would be a great one to scale up the quantities and serve as a punch at parties. Add all of the ingredients to a the bottom of a shaker or large glass, with ice. Stir with a long handled spoon for about 20 secs, then strain into an ice filled tumbler. 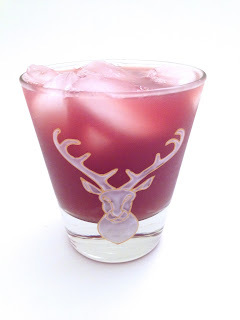 This final cocktail is loosely based on one of my favourite tequila drinks, El Diablo and is such a fabulously spooky colour, it's just crying out to be a Halloween party special. Firstly take a sharp paring knife and cut a strip of zest from your lime before you squeeze the juice out. Next, add all of the ingredients, apart from the zest, to a cocktail shake or large glass with ice. Stir for 20 secs and then strain into an ice filled tumbler. 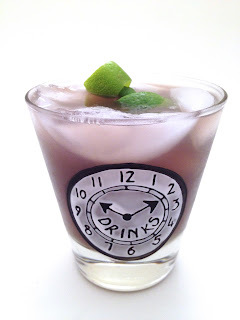 Twist the strip of zest over the rim of the glass, to release the essential oils and garnish the drink.